Bringing together nearly 100 researchers working on this issue from a variety of disciplines, representing 16 countries, the International Livestock Research Institute (ILRI), an A4NH Managing Partner, co-convened the recent Regional Symposium on Research into Smallholder Pig Production, Health, and Pork Safety. sector is facing different challenges in different countries. Use of feed, market access, and food safety issues are some of these common challenges." 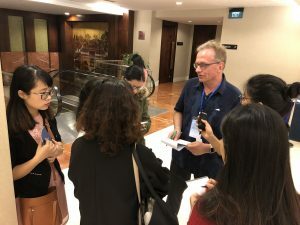 While much of the conference focused on Southeast Asia, attendees from Australia and Africa also brought perspectives that helped put together a more complete picture of the issues surrounding pork production. 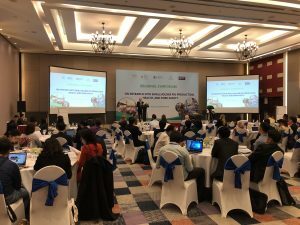 Held from March 27 to 29 in Hanoi, the even was supported by A4NH, and drew out research from the program on issues including food safety and antimicrobial resistance. Sustainability, affordability, and animal welfare. 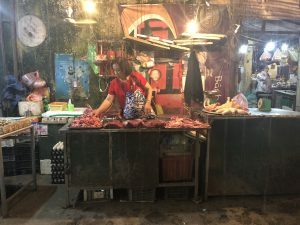 On the third day of the conference, attendees visited a wet market to see those preparing and selling pork, and then met with colleagues from the Vietnam National University of Agriculture (VNUA). The session concluded with a dynamic brainstorming on actionable items for attendees to pursue following the gathering. "This meeting provided the opportunity for all of us to know what one another are doing and achieving so together we can both build on the success of others and also avoid their pitfalls," remarked Tamsin Barnes, senior research fellow in the School of Veterinary Science at the University of Queensland and a co-organizer of the meeting. "This will help us to open up opportunities for smallholders in the region."